We are very proud of Regina Carter, a Detroit native who performed for many years with Detroit's all-female jazz group, "Straight Ahead." What's it like getting a cold call awarding you $500,000 with no strings attached? "I thought it was a prank," said Detroit-born jazz violinist Regina Carter, one of 25 winners of a 2006 grant from the John D. and Catherine T. MacArthur Foundation of Chicago. "I asked for his name and number, hung up and looked up the MacArthur Foundation to see if they matched." Announced today, the winners of the so-called genius grants come from many fields and were selected for their creativity and originality. Candidates don't know they are nominated until they win. The leading jazz violinist of her generation, the 44-year-old New York resident is known for the brushfire intensity and contagious excitement generated by her improvisations. Her CDs have explored swing-era ballads, Detroit's jazz legacy, Afro-Cuban styles and quasi-classical works. She attracted worldwide attention in 2001, when she became the first jazz musician to play Paganini's Guarneri del Gesu violin of 1743, a historic treasure in Italy. Copyright Â© 2006 Detroit Free Press Inc.
Thirty-seven years ago, jazz impresario George Wein (the man behind the Newport Jazz and Folk Festivals) was hired to produce a unique event in New Orleans that celebrated Louisiana heritage. Just 350 people showed up the first year, and the joke was that more than half of them were performers. The spirit of the event was born in the spring of 1970, when hometown girl and legendary gospel singer Mahalia Jackson and big-band leader Duke Ellington came across the Eureka Brass Band leading a crowd of revelers through Congo Square, the original home of the festival. Wein saw an opportunity and handed Jackson a microphone. The world's greatest gospel singer sang with her fellow New Orleanians and coaxed Ellington to join their homecoming parade. Little did they know then, but that chance meeting and convergence of music and heritage would be the genesis of one of America's most beloved and longstanding music celebrations, the New Orleans Jazz & Heritage Festival. It's not surprising that Billie Holiday recorded Fats Waller's most famous song, "Ain't Misbehavin'," in 1956. But given what we know of her life, it is surprising that she sang it with absolute purity, as if she weren't remotely tempted to misbehave. Backed by an allstar group that included trumpeter Charlie Shavers and tenor saxophonist Budd Johnson, Holiday's treatment is all the more compelling because she sings with an obvious awareness of the joys of misbehaving - of staying out late and partying - only to reject such pleasures in favor of her true love's kisses. That Holiday, whose lifetime of self-destructive misbehavior has been exhaustively documented, could sing so convincingly of sticking to the straight and narrow is a testament to her gifts as a musician, and as an actress.We often think of Holiday as a tormented woman who sang only from her own life experiences, who crooned about errant lovers who cheated on her and beat her only because she knew them personally. But Holiday could do much more: She was not a musical primitive who merely translated her own suffering into song. Rather, like Frank Sinatra or Nat King Cole, Holiday was a thorough professional who could interpret any lyric in the Great American Songbook - from the "Dese 'n' Dose" Ebonics of "Porgy and Bess" to the salon formality of Cole Porter or Oscar Hammerstein - and make it seem like an extension of herself. A dying breed of musicians? he plans to stay in Texas. AUSTIN -- Dancing and chanting and spinning his wild pirouettes inside the terminal at Austin-Bergstrom International Airport, here he comes: Big Chief Kevin Goodman, the prettiest Big Chief you've ever seen. On the stage -- at 2:30 in the afternoon beneath harsh fluorescent lights -- his five-piece Flaming Arrows have standby passengers confounded. A man in a business suit shuts down his laptop and stares at Goodman's neon Indian attire. A woman dances a tentative boogie-woogie but then sheepishly stops. With bright yellow ostrich feathers and long black tresses that swing like ropes, Goodman and his giant headdress are like nothing ever seen at Gate 10. He's a real live Mardi Gras Indian -- part of a centuries-old New Orleans tradition that blends hypnotic rhythms, flamboyant costumes and wild dances into a funky combination of performance art and street theater. In Hurricane Katrina's wake, Goodman made a forced landing in Texas along with the brass bands, the jazz hipsters and all the other traumatized and talented music makers displaced by the storm. FILIPINOS ARE AMONG the world's best jazz exponents, says renowned jazz artist Kevyn Lettau, and it's about time more Filipinos knew about it. Lettau told the Inquirer that it was with this in mind that she had jumped at the chance to participate in the first Philippine International Jazz and Arts Festival spearheaded by the Philippine Jazz Society (PJS). "Jazz artists here are not appreciated enough," Lettau said, "[I'd like] to help raise awareness among Filipinos that there are really good artists here." Imagine being the only surviving participant in one of the most admired groups in jazz history. Decades after its creation, a major recording recently has been discovered in your bandleader's long-neglected closet. Critics are practically breathless in their praise of this documentation of the near-mythic group. You would be eager to hear what the excitement was about, right? And you'd certainly want to hear what you created, and the extent of your involvement in all of this. Well, you're not pianist McCoy Tyner. Then again, there's only one. "No, I haven't heard it," Tyner said of the recently released "One Down, One Up: Live at the Half Note" (Impulse! 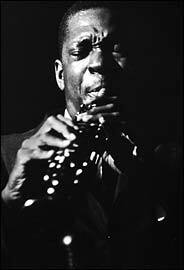 ), two CDs of the classic John Coltrane Quartet. "I guess I'll have to go to the record store and pick it up," he added with a laugh. AP Photo: Trumpeter Ken Ferdinand. NEW ORLEANS - While the city builds better levees and new homes, a mayoral arts commission is recommending that the city not forget to reclaim its legacy as the birthplace of jazz. The commission recommends building a National Jazz Center, which would be a museum, performance hall, recording studio and archive rolled into one. The recommendations â€” which were to be presented to Mayor Ray Nagin on Tuesday â€” also call for creating new artistic districts, increasing the teaching of arts in schools and setting aside 2 percent of eligible capital bonds for public sculptures, murals and other artwork. The ideas are part of a broad rebuilding plan being rolled out by the Bring New Orleans Back Commission, a panel appointed by Nagin after Hurricane Katrina hit on Aug. 29. The panel is coming up with a variety of ideas on how to rebuild the city â€” from abandoning some residential sections of the city to overhauling schools and city government. My favorite jazz record released this year, and one of my favorites of any year, was made in 1957. I first heard "Thelonious Monk Quartet With John Coltrane at Carnegie Hall" (Blue Note) at the Library of Congress in April, after the news of its discovery had been made public. It sounded pretty good then, but you can never really tell when hearing something over a high-quality sound system in front of interested parties. I have listened to it repeatedly since, and it seems to be much better than I first thought - solid, juicy, truly great. of live performances, and its impact on the genre. Another of the year's new jazz records - John Coltrane's "One Down, One Up: Live at the Half Note" (Impulse) - was made in 1965. It disqualifies itself from consideration for my list of the year's best jazz albums only because it has been heard, in bits and pieces, on illegal tapes for 40 years. (I got mine from a great saxophonist who wanted to spread the word.) But it is also, I think, a masterpiece. Melbourne's leading female jazz artists come together for a week-long festival. NEW ORLEANS (Reuters) - New Orleans-born musicians Branford Marsalis and Harry Connick Jr. are backing a new housing program to lure blues and jazz artists who fled the city in the wake of Hurricane Katrina. Marsalis, together with community building group Habitat for Humanity, unveiled on Tuesday plans to construct a Musicians' Village in the storm-wrecked city to restore one of the cultural mainstays that made New Orleans famous. "We're going try to build as many (homes) as we can, because there are more than enough musicians here. There are musicians in the hundreds that need our help, in the high hundreds probably," Marsalis told reporters. If you listen to interviews with Jelly Roll Morton, what you hear is your disreputable favorite uncle, fondly recalling his days as a rouÃ©: "Kaiser's, the Red Onion, Spanos: These were honky-tonksâ€¦dirty, filthy placesâ€¦gambling wide openâ€¦a lot of rough peopleâ€¦really dangerous to anybody that would go in and didn't know what it was all about." "They always had a broken-down piano.â€¦ After four o'clock in the morning, all the girls that could get out of the houses, they were there. And the girls would start, 'Play me something, boy, play me some blues.' I'd start playing this way." "Let me be your wiggler, until your wobbler comes. Let me be your wiggler, until your wobbler comes. Then tell your wobbler what your wiggler done." Brad Mehldau, above, has interpreted songs by Radiohead. 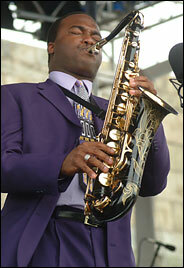 James Carter and three other musicians have released an album of Pavement covers. The Bad Plus has an indie-type fan base. James Carter and three other musicians have released an album of Pavement covers. NEW ORLEANS (Reuters) - Philip Frazier, who leads the New Orleans jazz group ReBirth Brass, was one of the lucky ones. His house and tuba survived Hurricane Katrina mostly intact. But hundreds of his fellow musicians were not so fortunate. The floodwaters that swept through this city nearly three months ago destroyed not only homes but also the instruments local musicians use to make a living, and cast doubt on the future of New Orleans' vivid musical traditions. "We were very blessed," Frazier said of ReBirth's revival after its members had relocated as far as Houston and Baltimore. "We were fortunate that we were able to regroup and go out and continue to make a living for ourselves." Katrina scattered musicians across the country, and shuttered many clubs and concert venues. More critically, perhaps, it halted the convention and tourism industries that supplied much of the audience. Jazz drummer Roy Brooks, who performed with many of the leading figures of the hard bop movement, died on November 15 in his hometown of Detroit, the Detroit Free Press reports. Brooks joined pianist Horace Silver's quintet in 1959, replacing his friend Louis Hayes. He remained with the group for five years; later, he played with saxophonist Sonny Stitt, saxophonist Dexter Gordon, and bassist Charles Mingus. He was a founding member of drummer Max Roach's ensemble M'Boom. The lights were bright on the stage of the Maison Bourbon Jazz Club as Jamil Sharif and his musicians made their first appearance since Katrina had darkened the club. There were only four patrons; waiting and wondering how would the music sound after so many weeks in exile. But when the notes of "Do you know What It Means to Miss New Orleans" filled the air all doubts were dispelled. Attracted by the hauntingly beautiful music, more and more people began to wander in. They were not the usual tourists as New Orleans has yet to recover enough to attract them. Instead they were an assortment of relief workers, insurance adjusters and laborers taking a break from recovery efforts. For many, it was the first time they had ever been exposed to a live performance of New Orleans-style music.